Sun Peaks Best Pizza - who do you think makes the best pizza pie at Sun Peaks? Sun Peaks Best Pizza - Who Makes the Best Pizza Pie? The maker of Sun Peaks Best Pizza is of course a matter of personal preference, but if you judge by the number of people lining up outside and smiling as they hold their steaming hot piece of pizza pie in their hand, we would have to say Mountain High Pizza. Nothing against other popular Sun Peaks restaurants like Bella Italia and Mantles (in the Sun Peaks Grand) since they make pretty good pizza too, but ask around where to get the best pizza at Sun Peaks, and chances are you will be told the best pizza anywhere is at Mountain High. According to my son, it is the best pizza in the universe!? It's not quite a ski-through pizza restaurant, but in winter you can ski right up to the front door since Sun Peaks is a ski-through village, and enjoy a slice of the best natural high on the hill. 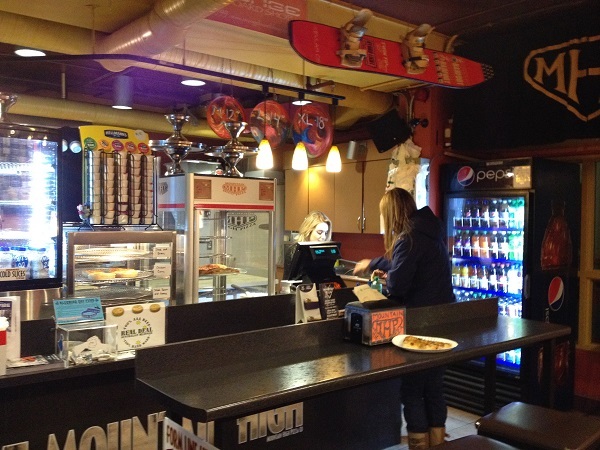 They have a large choice of fresh toppings, with many of the pizzas named after popular Sun Peaks ski runs, like Rambler, Top of the World and Grannie Greene’s. In addition to regular, thin and whole wheat crusts, they also have a gluten free crust available. Their Aussie meat pies are also mighty tasty, and if you want some greens to make you feel a little healthier, they have some nice salads too. Mountain High Pizza is located in the Hearthstone Lodge, very near the base of the slopes. It is a small restaurant, with two high-top tables and a long table inside with seats for up to 16 cozy people, and around the same number outside at the front. Order by the slice, whole pizza pie, or take and bake. How about an in-house dinner party for 8-25 people with high-end, gourmet meals prepared by Bottoms Catering (sorry - no pizza). Was it your favorite? Which is the best Sun Peaks restaurant in your opinion? Book luxurious Sun Peaks rental accommodation in our Stone's Throw condo or Trapper's Landing Townhouse.